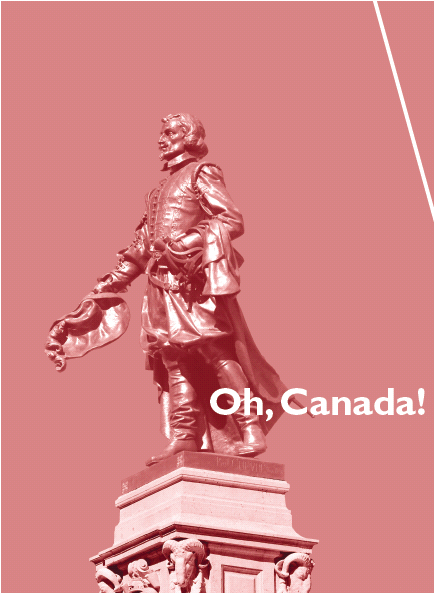 Gluten-Free Living > Gluten-Free Lifestyle > Oh, Canada! Savvy travelers usually start planning a trip by figuring out the fastest and best way to get to their destination. But my quest to find gluten-free eateries in Eastern Canada is a little trickier. Since the province of Quebec and surrounding coastal areas is vast, for this go-round I concentrate on a few large cities and a coastline dotted with picturesque fishing villages. Still, how to get a look-see at not just historic old Quebec and Montreal cities but also the smaller port towns from Nova Scotia to the Gaspe Peninsula and up the St. Lawrence River? Short of a hovercraft, it’s going to require a little ingenuity, and the only reasonable solution to dip in and out of the shallow ports is by ship. So an old friend and I find ourselves amidst a bevy of rather dapper French tourists on the Le Compagnie du Ponant’s 264-passenger Le Boreal, bound together in search of a common history and some gluten-free grub. By journeys end we will have found some gluten-free shortages but mainly a surprising array of delicious choices including hazelnut cake, savory crepes, and apple cobbler. Underway from Boston, we steam up the Eastern seaboard toward the historic Canadian town of Lunenburg, Nova Scotia, whose rows of brightly colored buildings slowly come in to view as we anxiously watch from the ship’s red chaises. The town is a perfect example of a planned British colonial settlement in North America. Unbelievably, 95 percent of the wooden stores, houses and workshops washed in bold reds, blues and yellows standing along the water’s edge and on the town’s hill are original. Despite a cool breeze, the sun is shining so we go explore, and are utterly surprised to find a bustling main drag more akin to Bar Harbor, Maine. 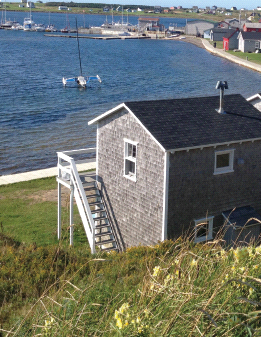 Like most of the coastal towns in this part of Canada, the waterfront is the heart of the city. Fishing, shipbuilding and social life revolved around some of the richest stocks of both fish and fur — including the now fished-out walrus – when these towns were built in the 18th and 19th centuries. Other than tourism, the same is still true of many today. But quaint little Lunenburg is also known for its folk art festival, and we wander the few streets that make up the port town. Lucky for us we’re visiting on a Sunday, when local performers take a turn belting it out in King Street’s outdoor pavilion. It’s not the Hollywood Bowl, but the folk music, Woody and Arlo Guthrie-style, couldn’t be better. We needn’t join the crowd on the grass – the music is just loud enough to take in from the Shop on the Corner, where I’m ecstatic to find several gluten-free goodies. 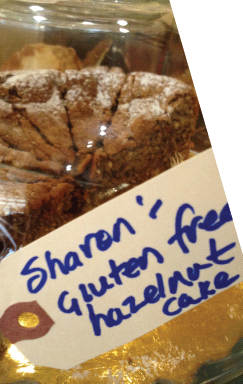 I dive into a piece of Sharon’s Gluten-Free Hazelnut Cake and a hot latte. I’m always amazed to discover fantastic gluten-free pastries and goodies, so I’m completely absorbed by the light texture and subtle hazelnut flavor. I’m not sure how the next few days will go so I make a rash decision and snap up the rest to go. Turns out to be a good bet, because as we head up and around the Gaspe Peninsula the gluten-free pickings get a little slimmer. Even in the bright sunshine of a fall day we feel a chill and wonder just how cold it gets the rest of the year. “Oh, it’s pleasant during the summer,” our chipper, bilingual guide, Hugo Petitpas, tells us at our stop at Iles de la Madeleine, a long and barren-looking group of islands. On a quick ride to the summer tourist town of La Grave, where there is a remarkably sophisticated artist community, Petitpas takes us up the road to the Musee de la Mer for a tour by his docent friend. Exhibits trace the history of the islands from their occupation by the Micmacs through Jacques Cartier’s arrival and their colonization by the Acadians from western France during the 1600s. On the way back to the ship, we stop at a café where once again there are hugs and hellos all around for Petitpas. Ah, it begins to make sense. These communities are small, tightly knit and rely on themselves and the sea. Somehow asking about gluten-free anything seems over the top, so we grab a yogurt and fruit cup and mum’s the word. While Le Boreal has the unique advantage of being able to pull into nifty little ports unavailable to larger ships, it also makes stops in larger towns like Tadoussac and Saguenay, deep in the heart of the Saguenay Fjord. Despite the towns’ size, we are going deeper into the land of the Quebecois, and finding dedicated gluten-free anything is becoming more difficult. It isn’t much of a surprise – the rise in awareness of the gluten- free diet is relatively recent, and it’s fair to say we’re in the boonies. But we’re enchanted by our smiling servers’ attempts to help us decide what is safest, and we learn to dial back our expectations. No gluten-free menus here, but the enthusiastic desire to please trumps, making eating part of the adventure. And the land is mystic. We’re convinced as we watch pods of beluga whales slipping along the fjord’s edges and dolphins jumping through the bow’s waves that what is below the surface may be vastly more interesting than what is above. And that’s saying a lot. In Quebec City, it’s off the ship and time to explore this largely Francophone city. With a history of military and political who’s who so long I’m scribbling notes to sort it out, it would be fair to simply say that in the end the parties split the pie. A handful of sea captains representing king and country spent decades searching for the Northwest Passage, in the meantime settling coastal areas. The result is that today’s people are a jumble of French, British and First Nations. The old city is divided into an upper and a lower portion, with classically European stone buildings made cheery with flower-draped window boxes, colorful operating shutters and shiny doors lining the cobblestone streets. It’s also the only fortified city north of Mexico and is as close to a European city as you’ll find short of crossing the pond. Most people speak both French and English, so translation isn’t normally difficult in either Quebec City or Montreal, but written material is often only in French, which can cause some difficulty. We’re booked at the Hotel Le Germain-Dominion, a medium-size boutique hotel on tony rue Saint-Pierre in the historic old city’s lower area. We couldn’t be better located, and the hotel’s simple façade hides a quiet but comfortable elegance. Dark wood tables, bookcases and a massive fireplace surrounded by overstuffed light linen sofas are masculine but cozy. To our delight, on arrival we’re shown the massive cappuccino/latte maker available for guests’ use any time of the day or night. Innovative — and it doesn’t malfunction once. A few quick instructions, and we’re happily sipping perfect gluten-free lattes by the fire. A morning cold breakfast is provided for guests. It’s a tray of American-style cold cuts, boiled eggs, fresh fruit, juice and, sadly, screamingly perfect croissants: warm, soft on the inside and golden crunchy on the outside. I curse gluten under my breath, silently swearing an oath to eventually locate the perfect gluten-free croissant. Because this is our first time to Quebec City, we opt for a city tour to kick things off. A few hours with a good local guide can make the difference between a destination being a pretty but meaningless place or having everything fall into place. There are group tours, but I find them difficult: too many people, hard to hear and impossible to ask questions. So we arrange a private morning tour of the city with a guide and car and get a rip roaring experience. We jet by the Parliament building on Parliament Hill with its bronze statues tucked into the façade; wind through the 270-acre park, The Plains of Abraham; get an overview of the city’s architecture; and finally visit the Marche du Vieux- Port, a huge year-round market which turns out to be just a 10-minute walk from our hotel. According to our guide, local chefs come to buy fresh goods from the farmers and producers who’ve come across the bridge from Ile d’Orleans with their wares before the rooster crows. 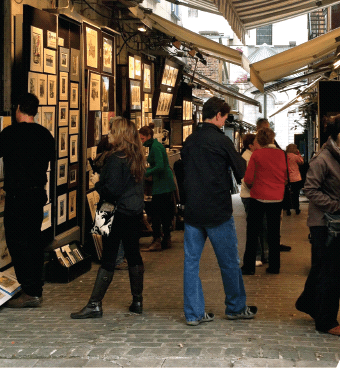 The artist’s alley, a narrow street permanently playing host to artists selling paintings, water colors and other media usually depicting a romanticized view of the city, is one of the quainter finds at the market. It’s a little like walking along the Seine in Paris, but more compact and colorful. Next door to our hotel is the Musee de la Civilisation, a museum we visit twice during our stay, once to do the self-guided tour of the permanent People of Quebec Then and Now exhibit, and another to visit the kids’ Discovery Zone in the lower floor. Innovative, engaging and thoroughly fun for a couple of tired adults, the exhibits captivate us just as much as the ones upstairs. Looking chic in new hats and sweaters we bought in Saguenay, we throw on flats and head out for a rambling stroll up the winding streets, past upscale boutiques, trinkety tourist joints and the occasional bookstore. 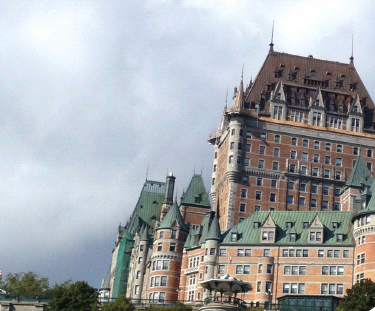 We’re heading to the upper city where the famous Fairmont Le Chateau Frontenac hotel sits like a queen on her throne. The Quebec Funicular Railway is a kind of trolley car on rails that chugs up the steep hillside to the top of the city and back down. A tourist attraction, it is jam packed most of the time. We try it once for kicks, but with so much to see we usually bag it in favor of hoofing it. By the time we’ve left Quebec, we can practically race up the hill. We hear that the Chateau’s Café de la Terrasse has gluten-free dining, but our excite- ment is squelched when we inspect the menu and see that, in fact, there are just a few very expensive gluten-free options. Turns out the shrimp appetizer is only a very small portion of shrimp cocktail. Famished, we leave hungry and irritable and head to Pain Beni, just at the top of the artist’s alley. Joy! Modern, efficient and pronouncing their ability to prepare every dish gluten-free on the front of their bilingual menu, the restaurant makes us all warm and cuddly, and ordering is a snap. I start with the Greek-style salad with feta and olives and follow with a very artfully prepped chicken breast on a bed of jasmine rice and julienned fresh vegetables. Light, filling and healthy. It fits the bill, and we revisit the restaurant again before jumping on the train to Montreal several days later. Despite a pretty rigorous Internet search in advance, and armed with recommendations from our hotel concierge, we work our way through a list of restaurants declaring themselves gluten-free. Some are impossible and others seem spot on. One of these is Cosmos Café, and to get there we board the nifty little Ecolobus, a public bus system that runs a circuit around the historic city all day. Cosmos is just a few minutes’ walk from the Parliament stop and is a vibrant little contemporary surprise, lit in neon pinks and blues. Our waitress hands me a dedicated gluten-free menu, explaining that the food is actually prepared in a dedicated facility and re-warmed at the restaurant. Sounds odd, but my friend has heard about this, so we give it a go. My vegetarian lasagna is sublime, as is the chocolate cake we decide to share. The crispy tart, a sort of Quebecois version of apple cobbler, is lighter and good, but do ask to have both the cake and cobbler heated or you’ll be disappointed. It’s become clear that despite advance preparation, eating gluten-free in Quebec requires the usual diligence in digging into details with servers and knowing when to say no. A roughly three-hour trip on the efficient VIA Rail Canada, complete with drinks and a small, gluten-free lunch of a piece of chicken, salad and fruit, takes us straight to Montreal. Not a four-star meal but quite nice, with a glass of white or red wine. We stay at the Hotel Nelligan, named after Quebec’s most celebrated poet, Emile Nelligan. It has sleek lines, with to-die-for beds and a similar breakfast setup to our Quebec City hotel. The morning continental breakfast is once again stocked with dastardly delicious-looking croissants and pain chocolate, but I’m getting used to the psychological abuse and move on to the fruit, eggs and yogurt. Once in Montreal, we come to realize it’s a whole other ball of wax from Quebec. An island metropolis with as many neighborhoods and things to do as any large American city, Montreal offers a much greater area to cover, and we’ll have to work harder to get to gluten-free digs. We lunch at the Musee d’archeologie et histoire de Montreal in the Restaurant L’Arrivage. The upstairs, glass-walled space has fabulous views of the Old Port, and while there is no specific gluten-free menu, they accommodate. And based on a few questions I generally quiz servers with, I feel pretty confident all is well. I order a delicious mixed salad of green beans, blue potatoes, chicken, goat cheese and grilled almonds with a homemade maple syrup dressing. With a glass of Chardonnay, a tasty meal and great company, it’s a memorable lunch. Feeling chipper, we try out the city’s clever new public bike system known as BIXI. Using the system that offers 5,000 bikes in 400 stations throughout an increasing number of neighborhoods, we each grab a bike, make a note of the station number where we pick them up and tool around the city. We figure we deserve a little energy pick me up and head to La Creperie du Marche, which serves up savory and sweet traditional French crepes. Only the savory are made with buckwheat, and they are masterful. The sweet would have been awesome, but since they’re made with wheat flour they’re out. The restaurant says they do not have cross contamination, and apparently the owner learned his crepe skills at La Creperie du Josselin in Paris. Can’t get better than that. Known as the city of festivals, Montreal comes alive in the summer. There are few days when a fete isn’t underway, and the city’s youthful drumbeat keeps people outside and moving. The Grand Prix kicks off the summer as streets are blocked and endless free performances are rotated in. The much-touted Underground City with an astounding 1700 shops is accessed via a Metro system. On the day we visit, we do a brief run-through, but not being bona-fide shopaholics, once we get our bearings we’ve had it and head up and out to lunch at the Latin Quarter’s hot new allergen-free restaurant Zero8, named for Canada’s main allergens. The area is artsy, up and coming, and teeming with students from the University of Quebec at Montreal sitting in cafes, madly working their cell phones and grabbing a bite in the sunshine. 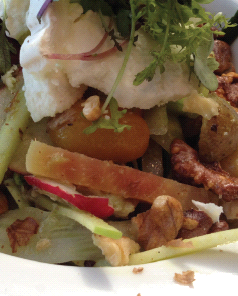 The place is smashing – a completely allergen-free restaurant with hip, knowledgeable owners and chef. Everything is worth eating, period. Another interesting restaurant nearby is Crudessence, an organic, gluten-free, vegan, and living restaurant. With dishes like sushi, wraps and BLTs, you could spend a week eating there and not make it through the menu. It and Zero8 are must-go’s in Montreal, hands down. On our last evening, tired and needing to pack to leave, we head across the street from the hotel to the humble little Indian restaurant Taj Majal. I eat Indian food at home safely and am curious what we will hear about gluten-free food at this restaurant. According to our server, not only is the menu gluten-free – aside from the Naan bread – but even the chips brought to the table as a sort of starter are made of lentil flour and the companion sauces are fresh mango, tamarind and a yogurt-mint mixture. We order simple Tiki Masala and Vegetable Korma and, with a long flight back pending, pack it in early. I realize I still have a few bags of emergency granola and rice cakes I brought from home, a great sign that traveling with a gluten-free restriction is not only doable but can be pretty simple. I think I will most remember Sharon’s Hazelnut cake in Lunenburg and the way the light hit the colorful buildings and buoys on the wharf. And of course, the Canadians. Always friendly, intelligent, and willing to lend an ear – we couldn’t have hoped for more. Andrea Kitay, a former Los Angeles Times columnist, is thriving gluten-free in Southern California, where the temperature is quite a bit warmer than the Canadian north. 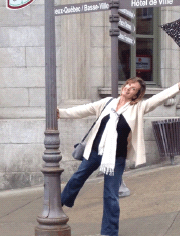 She is a regular travel contributor to Gluten-Free Living.